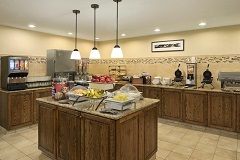 At the Country Inn & Suites, Fargo, ND, guests enjoy a complimentary, hot breakfast, a convenient, on-site pub, and easy access to an array of delectable nearby restaurants. Ask our friendly staff for top area dining recommendations! Our free, hot breakfast includes a delightful spread of morning favorites like toasted bagels, flavorful yogurt, syrup-coated waffles and fluffy eggs. Looking for lunch and dinner options? Explore the menus of popular Fargo restaurants like the Crooked Pint Ale House, which is located within walking distance of the hotel. 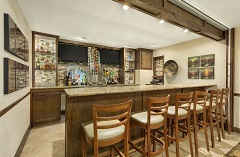 Order creative cocktails paired with appetizing snacks at our convenient, on-site pub.